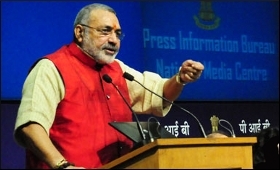 Union Minister of State for MSME, Giriraj Singh, inaugurated the MSME pavilion at the 38th India International Trade Fair (IITF) in New Delhi on Thursday. Speaking on the occasion the Minister said that quality manufacturing and inclusive growth of village industries plays a key role in the development of the country. The Ministry of MSME has set up its stall under the banner of MSME Expo 2018. Over 50 MSME entrepreneurs are showcasing their products at the stall. The theme of this year’s Expo is “Rural enterprises in India”. The MSME Expo exhibits are on Solar Charkha Scheme Products, Process Development Centres, Skill Development and Procurement Marketing Assistance Schemes. Cluster Development Programme with special focus on fragrance & flavour development and Solar Charkha Mission. Other schemes of the Ministry are also exhibited in the pavilion. A wide range of products which includes engineering goods, food, handicrafts, leather, textiles and hosiery, electrical and electronic appliances, auto components, readymade garments, gems & jewellery, cosmetics and herbal products are being displayed in the MSME Expo, 2018. The Union Minister of State also inaugurated the Khadi Pavilion set up by the Khadi and Village Industries Commission (KVIC).